Húsavík, by Skjálfandi Bay in North Iceland, is a town of just over two thousand people. It is considered to be one of the best places in Europe for whale watching in the summer. 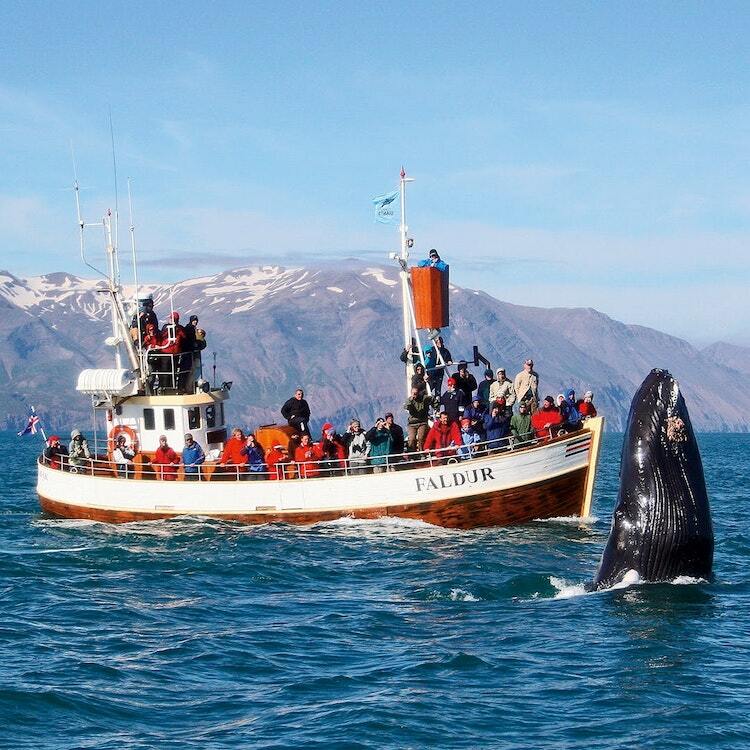 Húsavík is often nicknamed the whale watching capital of Europe, due to the fact that throughout the vast majority of summers, tour operators have 100% sighting rates. Humpback Whales are the most common species in Skjálfandi Bay. These gentle giants are renowned for being possibly the most entertaining of the great whales to observe, due to the fact they always show their tail before a dive, and exhibit many other behaviours at the surface, such as breaching and fin slapping. Other animals that reside within the bay include White Beaked Dolphins and Harbour Porpoises. It is not at all unheard of, however, for Fin and Blue Whales to be seen, nor Orcas or Belugas. Many whale watching tours also include a puffin-watching component. Húsavík is home to the Húsavíkurkirkja church, a beautiful wooden structure built in 1907 and the civic museum for culture and biology, which amongst other things features a stuffed polar bear and ancient boats, bearing witness to the history of seafaring in Iceland. There is also an Exploration Museum on the spirit of discovery, from early explorations to space missions. Near to Húsavík is the Lake Mývatn area, a place of diverse, natural beauty, with a wealth of geological features. It is also close to the capital of the North, Akureyri. In Húsavík you'll also find cute cafés and restaurants offering tasty treats, and you'll have a gorgeous view over the Skjálfandi Bay. There is a wealth of accommodation options available, from nice hotels to cabins and hostels. Húsavík means ‘the Bay of Houses’, as according to legend, it was settled before the official ‘settlement date’ of 874 AD. Garðar Svavarsson was a Swede who wintered in Iceland in 870 AD. According to legend and Sagas, he left a man called Náttfari and two slaves to tend a farm here. It is said that the town was named after their houses. The stubby peninsula of Tjornes in North Iceland is one of the best-known geological locations of the country. Layers of fossil shells and lignite can be found on the coastal cliffs down from Ytri-Tunga farm on the western side of Tjornes. Colonies of puffins and other sea birds nest on the cliffs along the eastern coast. Askja is a caldera in the central Highlands of Iceland, just north of Vatnajökull glacier. It is best known for its dramatic eruptions, as well as the training grounds for Apollo astronauts because of its otherworldly, lunar landscapes. The highest point of the mountains forming the crater is 1,510 metres (4.954 feet), which is remarkably tall for an Icelandic peak. Askja is a popular destination for hikers, with mountain huts to reside in, although can only be accessed in summer with a four-wheel-drive vehicle. Askja was not known to a feature of note throughout most of Iceland’s history; it would only gain significant attention 1875, when it erupted with great force, and poured poisonous ash across much of the East Fjords; this ash reached far Poland, to give some idea of the scale. The effect on the local people was catastrophic, as livestock and crops wilted and died. This forced a major wave of emigration from the country to the United States and Canada, and many towns on their East Coasts have high populations of Icelandic descendants, particularly the Canadian town of Gimli. Though this appeared to be the first time Askja was known to have an international impact, it was not; 11,000 years ago, tephra from its eruption got as far as Romania. Askja last erupted in 1961, though to no such significant extent. It has, however, rumbled since, with there being tremors in the region in 2010, and no ice cap in April in 2012, indicating heat below the peak. Askja is also well known for being home to the second deepest lake in Iceland, Öskjuvatn, which misses out on the top spot for the newly formed Jökulsárlón glacier lagoon. Lying about 50 metres (164 feet) beneath the main level of the caldera floor, it has depths of up to 220 metres (722 feet). This lake was formed after the 1875 eruption, and covers an area of twelve square kilometres (about five square miles). It is frozen the majority of the year, and if unseasonably liquid, a worrying sign of a potential eruption. Askja sits in what is called the ‘rain shadow’ of the great Vatnajökull glacier. 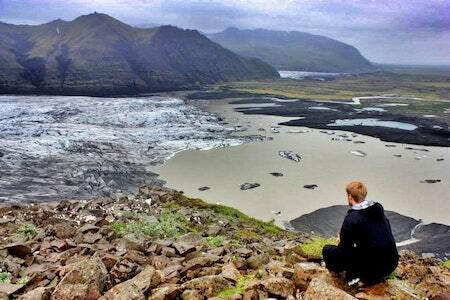 This means that the area is remarkably dry, with only 450 mm of rain annually, about half of what falls in Reykjavík. It is also particularly cold, due to its elevation and proximity to the glacier. These conditions mean that there is little to no vegetation surrounding Askja, and as such, it was a perfect place for Apollo astronauts to acclimatise to the environment of the moon. While other places around the country, such as the Reykjanes Peninsula were also used, this particular environment was considered the most accurate reflection of a lunar landscape. The Apollo scientists were far from the only ones to come to Askja, with it attracting meteorologists, geologists and volcanologists for decades. In fact, before the astronauts came, Askja had already claimed the lives of two people studying it. In 1907, two scientists from Germany, Walter von Knebel and Max Rudloff, were studying the volcano, and took a boat journey out onto the surface of Öskjuvatn. They would never return, nor would any sign of them be seen again, in spite of the hard work of von Knebel fiance, Ina von Grumbkow. What happened to them has been an enduring mystery, a probable answer to which was finally found in 2014. A study taken in this year in the caldera revealed what effects a landslide can have on the lake. When displaced earth struck its surface, it caused a wave 30 metres (98 feet) tall. Any small boat in its path would have been completely shattered, and it is little wonder why no sign of them has ever been found. Hljodaklettar (‘Echo Rocks’) is a distinctive cluster of columnar rock formations, located by Jokulsargljufur in Vatnajokull National Park. Hljóðaklettar stand at the entrance to Vesturdalur, down by the river Jökulsá á Fjöllum. The columns lie at all angles and derive their name from the strange echoes created by the numerous caves and uncommon rock formations. Odadahraun is the most extensive lava field in Iceland, with a total area of around 4-6000 km² (definitions vary), consisting of relatively young and rough lava. It lies north of Vatnajokull and at its northern border are mountains Blafjall and Sellandafjall. Its boundaries are further marked by the great glacier rivers Skjalfandafljot to the west and Jokulsa a Fjollum to the east. The area is dry and there is little as no vegetation. Sand storms there can also be very strong. The area is considered a part of Vatnajokull National Park. The only road through Odadahraun that is accessible by car is Gaesavatnaleid. The area is strong in volcanic activity, the most famous volcano being Askja in the Dyngjufjoll mountain range. Further north of Odadahraun more lava stretches all the way to the sea with some eruptions having occurred in the sea. Here you find the volcano Krafla and the Gjastykki geothermal area. The impressive mountains Trolladyngja and Herdubreid are found further south. Herdubreid is the highest mountain of the area, a tuya mountain, 1682 meters high. Near Herdubreid is the oasis Herdubreidarlindir, a popular stop for travelesr that offers a camping ground and several hiking trails. This area, along with the Sprengisandur sand field further west, is known for hosting outlaws in former times, the most famous being Fjalla-Eyvindur and his wife Halla and their fellow outlaw Arnes. Their story, already legendary, was dramatized in playwright Johann Sigurjonsson’s play Fjalla-Eyvindur, later made into the Swedish film Bjerg-Ejvind och hans hustru (e. title ‘The Otlaw and his Wife') by Victor Sjöström. Herdubreidarlindir is an oasis situated near Herdubreid mountain north of Vatnajokull glacier. The area features a campground and hiking trails and is popular with travellers. More than 72 vascular plant species may be found there. Herdubreid also has rich birdlife which includes pink footed geese, harlequin ducks, Arctic terns, swans and red-necked phalaropes. Outlaws would seek refuge in this area in former times, the best known being Fjalla-Eyvindur. Hellnar is an old fishing village on the westernmost part of the Snaefellsnes peninsula. It used to be one of the largest fishing stations of the peninsula, with the oldest written record of seafaring there from 1560. Historically, the settlement was a hub of activity, with many trading and fishing vessels pulling in and out of the harbour daily. There were many farms around the area, and by 1703, 38 houses. Though by modern international standards this was nothing, it was rather significant for Iceland at the time. Throughout the nineteenth and twentieth centuries, however, Iceland began to develop and industrialise, and its fishing and trading industries began to move to Reyjavík, bringing with them many people. Hellnar, therefore, rapidly lost its population and importance, like many other places in Iceland particularly on the Snӕfellsnes Peninsula. The change in the economy hit Hellnar particularly hard, however, considering it was increasingly neglected for the neighbouring village of Arnarstapi, which was favoured by the ruling Danish. The settlement was abandoned but for a few farms and a few resilient locals, until tourism began to boom in Iceland. Now, it is a centre for visitors in the area, with many options for rural accommodation. Hellnar hosts the guesthouse for Snӕfellsnes National Park, which has a very interesting exhibition about the economy of former times, and on the geology, flora and fauna of the park. At the shores of Hellnar are spectacular rock formations; much of the Snӕfellsnes Peninsula is incredibly dramatic along its coast, due to the previous volcanism of the area and the waves shattering the brittle lava rock that makes up the land. Most notable amongst these that can be reached on foot is a protruding cliff called Valasnös. It has tunnels into the cliff, and its colouration is affected by the time of the day, the movements of the sea, and the prevailing weather conditions. Large colonies of birds nest in the area, although it should be noted that puffins do not. Hellnar, located at the tip of the peninsula, is a convenient hub for those travelling in their own car, offering easy access to the incredible natural sites nearby. These include the Lóndrangar sea stacks, the mountain Kirkjufell, and the Ytri Tunga seal watching beach. Like many other places on Snӕfellsnes, it is easy to see the beautiful glacial capped volcano Snӕfellsjökull from the village. Arnarstapi is a village on the southern side of the Snæfellsnes peninsula, once a fishing hub and now a place for travellers to refuel before entering Snæfellsjökull National Park. The area has several old and charming houses with interesting stories to them and is renowned for its beautiful nature. Records of settlements around Arnarstapi date back to the Bárðar saga Snæfellsáss, an ancient Icelandic Saga that tells of the half-human, half-ogre who once lived on the Snæfellsnes peninsula. Since his death, he has been considered the area's guardian spirit. The region was popular with settlers due to its natural harbour, meaning fishing in the rich herring grounds of the surrounding waters was easy. When Norway, and to a much greater extent when they took over, Denmark, were in control of Iceland, Arnarstapi grew increasingly as a trading port. Denmark invested a lot of money into Arnarstapi throughout the eighteenth and nineteenth centuries (for their own interests, unfortunately not those of the Icelanders). Many of the resulting buildings still stand today, being some of the oldest in the country, such as the Danish Prefect’s Residence, which was built in the 1770s. In the industrial revolution, Arnarstapi’s population radically shrunk which was common in the countryside at this time. The vast majority of Iceland’s jobs were now centralised in Reykjavík, reducing opportunities for small-time fishermen and their businesses, and the town became little more than a hamlet as a result. As Iceland’s infrastructure rapidly improved after independence in 1943, and more people abroad began to see the many wonders of this island as a travel destination; Arnarstapi, like many other settlements in the area, got a new lease on life. Fishing and trade remain vital parts of the economy, but they now play second fiddle to tourism and services. The village has essential services for those travelling on the peninsula, a wide array of accommodation options, and tour companies operating from it. The beach at Arnarstapi holds a particular attraction. It has an eroded circular stone arch, called Gatklettur, and here, the interplay of spectacular waves and the light of the sun create a fascinating spectacle. Large colonies of the arctic tern also nest in the area, and both these features make it very popular amongst photographers. An old horse trail through the lava field Hellnahraun is highly popular for hiking, due to the impressiveness of the surrounding landscape. Arnarstapi, however, should never be too long a stop on a tour of the peninsula. As lovely as it is, the natural attractions nearby simply warrant more time. The village, for example, sits on the cusp of Snæfellsjökull National Park, home to the Snæfellsjökull glacier and volcano, the beauty of which has inspired writers and artists for centuries. This is one of only three National Parks in the country, but it is to the credit of the peninsula’s beauty that it is far from the only must-see destination around. Very close to Arnarstapi is the Lóndrangar basalt cliffs, huge towers of lava that from a distance look like a fortress. Vatnshellir and Sönghellir and two nearby lava caves (the former of which can only be entered on a guided tour). 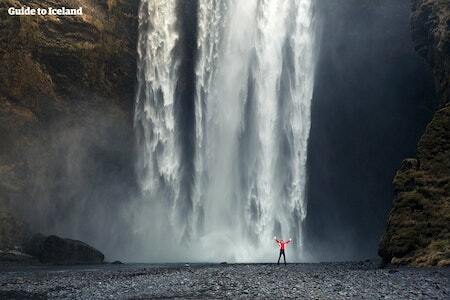 There is also a beautiful cleft in a mountainside called Rauðfeldsgjá Gorge that it is possible to climb into. Though a little further away, on the north of the peninsula, Kirkjufell mountain is also a wonderful site to behold. Skútustaðagígar is the name of a row of pseudo-craters in north Iceland. The Skútustaðagígar Craters are found in the Lake Mývatn area, which is very volcanic, being near to the Krafla volcano system. The nature of the lake itself and the volcanism of the region both led to the creation of these unusual formations. During an eruptions, lava ran across the area of Skútustaðagígar, which at the time was swampy wetlands. The heat caused steam eruptions, which resulted in their crater-like shape. As they were not the sources of lava, or volcanoes in themselves, they are not considered true craters. The Skútustaðagígar craters are surrounded by the remaining wetlands of the Lake Mývatn area. This region is a hotbed for birdwatching, with many species of duck found in the waters throughout the year. The Lake Mývatn area has many other attractions, such as the Dimmuborgir lava fortress, the Grjótagjá hot spring cave, and the luxurious Mývatn Nature Baths. Krafla is a caldera, part of a greater volcanic system of the same name, located north of Lake Mývatn in North Iceland. It is one of the country’s most explosive volcanoes, having gone off approximately 29 times since the country was first settled. The crater of Krafla’s caldera is about ten kilometres (seven miles) wide, although its fissure zone extends for 90 kilometres (56 miles). The Víti crater is located in this fissure zone, famed for the green lake within it. At its tallest, the peak of Krafla is 818 metres (2684 feet) high. With 29 eruptions under its belt since settlement, Krafla has long had a reputation as an unpredictable and dangerous feature. Two, however, were more significant then the rest. The Mývatn Fires were the first of these. Continuing for five years from 1724 to 1729, the fissure erupted across much of its length, and sent lava fountains so high in the air that they could be seen all the way across the Highlands, on the South Coast. No one was killed directly by this eruption, although considering the ash and toxic fumes, it is difficult to be certain of how many indirectly died. It did, however, destroy three farms. The second major eruptive episode at Krafla occurred between 1975 and 1984. Nine separate eruptions occurred, limiting services, industry and tourism in the area, and dramatically changing it. For example, the hot spring of Grjótagjá was accessible prior to the eruption, but the temperature is now incredibly volatile. Since 1977, surprisingly established during an eruptive episode, a power station has existed at Krafla, helping the north with its green energy needs. Since then, there have been further attempts to harness its incredible power potential. The most notable of these was a survey taken in 2006 that revealed a vast amount of lava just below the surface of the earth. This led to the creation of the Icelandic Deep Drilling Project’s first well, which discovered liquid rock a mere two kilometres (just over a mile) beneath the earth’s surface. Krafla is blessed with an incredible location, meaning visits to it can be accompanied by lots of different sites. 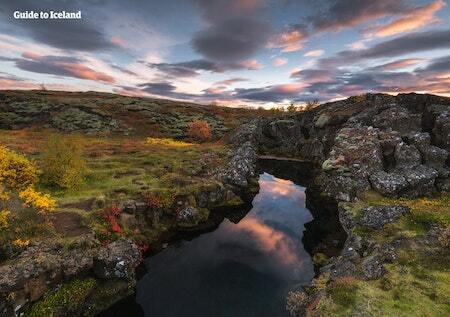 This is because it sits in the Lake Mývatn area of the north, which is renowned for its diversity. The lake itself, or, more correctly, the lakes themselves, are beautiful and serene, with dozens of species of nesting bird, fascinating flora and a wealth of geological sites. Amongst these, the Dimmuborgir lava fortress is the most impressive. Krafla is also relatively close to the most powerful waterfall in Europe, Dettifoss, and an incredibly verdant horseshoe-shaped canyon, Ásbyrgi. Reykjahlið is the closest settlement to Krafla, though small and with few services. The towns of Akureyri and Husavík, however, are still relatively close, and perfect for refreshment and rest. The former is the largest settlement outside of the Reykjavík area, whereas the latter is often called the whale-watching capital of Europe. Dalvík is a village within the municipality of Dalvíkurbyggð in North Iceland, with a population of approximately 1,400 people. The municipality of Dalvíkurbyggð is located on the Tröllaskagi Peninsula and west of fjord Eyjafjörður. Dalvík is the precinct’s main village, but the municipality is also made up of the rural districts Svarfaðardalur and Árskógar. Dalvík as a village only came into existence a little over a century ago. Before that, the area consisted of scattered farmsteads and a few buildings dedicated to the fishing which the farmers practised alongside general agriculture. When Norwegian fishers started flocking to the area for its bountiful herring population around the turn of the 20th Century, the village grew rapidly and soon became the third largest herring-port of the country. The festival Fiskidagurinn mikli, or ‘The Great Fish Day’, is still held annually to celebrate these golden days. Central to the festivities, which include live music and fireworks, is a free-of-charge seafood buffet, where local fish producers supply the ingredients while the residents communally contribute their resources and cooking skills. In 1934, the area’s most powerful earthquake in recorded history destroyed a great deal of the village and left approximately 200 people without a home. The quake is known as Dalvíkurskjálftinn and was reportedly felt throughout North Iceland. The village is home to the museum Byggðasafnið Hvoll, which has a segment dedicated to the historical earthquake and its effects on the town. Skiing is a popular sport in Dalvík and the skiing area of Böggvisstaðafjall is favoured across the country. The village has birthed a series of accomplished skiers, some of which have represented Iceland in the Winter Olympics and other large international competitions such as World Cups and World Championships. Just off the coast of Dalvík is the island Grímsey, the northernmost inhabited area of Iceland. The ferry Sæfari makes port in the town’s harbour Dalvíkurhöfn, connecting the inhabitants of Grímsey to the rest of Iceland. The Lóndrangar basalt cliffs are amongst the many geological wonders of the Snæfellnes peninsula. Once a volcanic crater, all that remains after aeons of ocean battering are two great pillars upon a cliff, one 75 metres (246 ft) high and the other 61 metres (200 ft). The cliffs can be accessed easily from the Visitor’s Centre, through fields of mossy lava, but they can also be seen from the sea. Surfing is relatively popular in the area and doing so in the shadows of these great peaks only adds to the experience. The surrounding lands are steeped in folklore; farmers have never made use of the fields around the Lóndrangar basalt cliffs due to the elves that are rumoured to live there. Nearby, at Þúfubjarg, another cliff on the Snӕfellsnes Peninsula, it was said that the poet Kolbeinn Jöklaskáld met the devil and struck a deal with him. Djúpalónssandur is an arched-shaped bay of dark cliffs and black sand, located on the Snæfellsnes Peninsula in western Iceland. The location was once home to a prosperous fishing village, similar to other abandoned hamlets and ports of the area such as Búðir and Hellnar. These thrived back when the Snæfellsnes Peninsula functioned as one of the most active trading posts of the island, but now are simply centres for tourism. Fascinating remnants of this period are found in the form of four ancient lifting stones that still occupy the beach. The stones range in weight from 23 kg (50 lbs) to 155 kg (342 lbs) and were used to test the strength of fishermen. Their names are Amlóði (useless), Hálfdrættingur (weakling), Hálfsterkur (half-strong) and Fullsterkur (full-strong). Even today, you can see how you would have fared working on Iceland's dangerous seas by trying your luck at lifting these stones. In 1948, the English trawler Epine GY 7 from Grimsby shipwrecked on the shore, with fourteen dead and five survivors. The rusty iron remains of the vessel remain scattered on the beach, now protected as a monument to those who perished. The Snæfellsnes Peninsula boasts countless natural wonders, where locals and travellers both flock on a daily basis to enjoy the unique landscape and stunning coastlines. Djúpalónssandur’s black pebble beach is particularly stunning with its rocky coastal lava formations, which include a large lava rock with a hole in the middle through which you can directly spot the Snæfellsjökull glacier volcano. Behind the rocks are two freshwater lagoons called Djúpulón and Svörtulón, with the former serving as the namesake of the bay. Though believed in olden times to be bottomless, the water bodies were later revealed to reach the depth of just five metres. Lagoons such as these are held in high regard amongst the Icelandic people, and Svörtulón is thought to possess healing properties, especially after having been blessed by Bishop Guðmundur góði ('the good') in the late 1100s. A natural monument of the area is Söngklettur, or “singing rock”, a large lava rock with a reddish hue that resembles an elfish church. Other rock formations of folklorish appeal rest close by, including the alleged trolls-turned-to-stone Kerling and Lóndrangar. When visiting Djúpalónssandur, take heed that these are treacherous waters and the Atlantic Ocean’s powerful suction can easily carry you out to sea. This beach is not one for wading, but enjoying from a safe distance, especially if the weather is stormy. The video below shows the power and shocking speed of sneaker waves that occur at locations such as Djúpalónssandur and Reynisfjara in the south. The glistening pebbles that make up the beach known as Djúpalónsperlur, or “pearls of the deep lagoon”, are gorgeous to look at and might seem appealing to stone collectors, but they are protected by law and should not be removed from the area by visitors. Credit: Wikimedia, Creative Commons. Photo by Michal Gorski. Ólafsfjörður is a town in North Iceland with a population of approximately 785 people. The town is located in a fjord of the same name. Together with the town of Siglufjörður, Ólafsfjörður forms the larger municipality of Fjallabyggð. Ólafsfjörður started to form at the end of the 19th Century, before growing around its harbour during the golden days of bountiful herring fishing in the area in the 1940s and 1950s. Today, the herring is gone, but fishing still makes up the town’s main industry, along with services related to tourism. The town boasts numerous sporting groups, respectively dedicated to golfing, horse riding, skiing, shooting and snowmobiling. Skiers can make their way to Tindaöxl, where there is a lift that can take you up the slopes of the mountain above the town. Within Ólafsfjörður, there is also a geothermal swimming pool that is open all year round. The Secret Lagoon is a man-made hot spring of natural resources located at Hverahólmi, the geothermal area next to the village of Flúðir in southern Iceland. It is the oldest pool in the country, and one of the most popular for locals and tourists alike. Though not as busy as the Blue Lagoon, it still requires pre-booking in the summer. The hot spring is situated within the range of popular tourist route the Golden Circle, close to the waterfall of Gullfoss, in the village of Flúðir. This village is renowned for its greenhouse activity, which is used for horticulture and agriculture in the form of many greenhouses. This helps Iceland produce fresh food throughout the year. Another major advantage of this geothermal activity is the natural and age-old thermal pools to be found in the area. Hrunalaug is one of those, a minuscule natural hot spring that has regrettably undergone a great deal of damage in the last years due to increased numbers of visitors. The Secret Lagoon, however, has been modified to accommodate a much larger number of people. It makes use of its natural terrain and geothermal heating, leaving the water at a temperature of 38-40° Celsius (100° Fahrenheit) all year long. The area all around the hot spring consists of mossy lava fields and geothermal hot-spots, including a small geyser that erupts every 5 minutes or so, which can be seen from the pool. A path by the pool allows you to explore this area with ease. The steam that rises from the surrounding terrain into the air gives the place its distinct and magical atmosphere. The pool was constructed in 1891 and is officially the oldest swimming pool in the entire country. Icelanders simply call it 'the old pool' or 'gamla laugin'. In the year 1909, the first swimming lessons took place in the pool, which continued until relocated to the new pool in Flúðir in 1947. Before the 1900s, the Icelandic people rarely knew how to swim, in spite of being a nation of fishermen surrounded by an ocean. Today, near every single Icelandic person is an able swimmer, since swimming lessons are conducted in pools and are mandatory for every Icelandic child. After the opening of the new pool in Flúðir, the Secret Lagoon was all but forgotten, falling into disrepair. Once its ownership changed hands, however, it underwent a renaissance. It has since then been thoroughly renovated, although maintains both a natural charm and air of abandoned, fairytale-like mystery. It now attracts hundreds of people every day. The Secret Lagoon is often compared favourable to the Blue Lagoon, for being cheaper and less busy. While true, the Blue Lagoon has more facilities, such as saunas and steam rooms, and a wealth of unique properties, such as its azure waters and silica masks, that distinguish it. It is also closer to Reykjavík, near to Keflavík International Airport. This means that it can be visited to refresh after a long flight, or in preparation for one. Both, however, are in beautiful, serene locations and have their own distinct charm, so many visitors indulge in trips to both. Tröllaskagi is a dramatic peninsula in north Iceland, renowned for its enormous mountains and high population of Icelandic horses. Outside of the Highlands, Tröllaskagi has the tallest mountains in Iceland, many exceeding 1,000 metres (3281 ft) in height. The tallest here is Mount Kerling, which is over 1,500 metres (4921 ft) tall. In spite of its elevation, the permanent glaciers on the peaks are miniscule compared to even average Icelandic ice caps. Many valleys and bays were carved at the end of the last ice age, meaning the region is home to many rivers and waterfalls. The Tröllaskagi Peninsula lies to the west of Eyjafjorður, the fjord in which the ‘capital of the North’, Akureyri, is nestled, and to the east of Skagafjörður. In spite of its tall mountains, its lowland regions have quite a high population, due to excellent fishing and surprisingly fertile lands. Most farms are horse-farms, and riding is a popular activity in the area. Icelandic horses are a unique breed, known for being smaller than others, but also more intelligent, curious and sturdy. They also have their own unique gait, the tölt, making them a favourite amongst equestrians. Though only at the base of the peninsula, Akureyri is the most popular town in the area. It has a wealth of museums and galleries, excellent opportunities for whale-watching and other tours, and is close to highlights of the north such as Lake Mývatn and Goðafoss waterfall. Besides the Capital of the North, the most popular towns on it for visitors are Hofsós and Siglufjörður. Hofsós is most renowned for its Infinity Pool, an outdoor swimming pool with unbelievable views over the fjord and ocean. Those who have a walk along the cliffs here will also note some beautiful basalt rock formations. Siglufjörður, meanwhile, is best known for it Herring Era Museum. This museum has won an international award, and discusses how fisheries sustained the Icelandic populous in such tough conditions before the country’s development. The Diamond Circle is a famed 260 kilometre (162 mile) sightseeing route in the northeast of Iceland, characterised by its sheer number of natural attractions, picturesque settlements and fantastic landscapes. The Diamond Circle is available for those who wish to drive the route themselves, as well as those who would prefer to partake in a guided tour of the region. It is considered the northeastern alternative to the popular Golden Circle sightseeing route, which is reached by travelling for forty minutes from Iceland’s capital, Reykjavík, and comprised of the three major sites Þingvellir National Park, Geysir Geothermal Valley and Gullfoss Waterfall. The route’s four main attractions are Lake Mývatn, Europe’s most powerful waterfall, Dettifoss, the horseshoe-shaped canyon, Ásbyrgi and the fishing town of Húsavík, known primarily for its fantastic whale watching opportunities. Lake Mývatn is one of the most popular sites of the north; it is a favourite location for birdwatchers in particular, who can see dozens of species year round. The lake area is also known for its flora, being home to rare moss balls and many wildflowers, and its geology. This takes the form of basalt pillars rising from the waters, pseudocraters surrounding them, and the lava fortress of Dimmuborgir. Dettifoss is the most powerful waterfall in Europe, found in the Jökulsá á Fjöllum river in the Jökulsárgljúfur Canyon, which is part of the great Vatnajökull National Park. It is 40 metres (131 feet) tall and over 100 metres (328 feet) wide. Dettifoss is one of three waterfalls in the river; Selfoss is just a little upstream, while Hafragilsfoss is downriver. The horseshoe shaped canyon of Ásbyrgi is so perfectly formed that one could be forgiven for thinking it has divine origins. This is, in fact, what old Icelanders used to believe; according to legend, it was created when one of the hoofs of the eight-legged horse of the god Oðin made contact with the earth. The land within the canyon is well-forested, due to the shelter that the sheer cliffs provide. Húsavík is often nicknamed ‘the whale-watching capital of Europe’, due to the wealth of life in its waters. Most tour operators boast 100 percent sighting rates on their tours throughout summer, with the most common species being humpback whales and white-beaked dolphins. Over twenty species of cetacean, however, are found in Iceland’s waters, and there is a chance of seeing any of them, depending on the time of year, from the town. Blue whales, for example, have been seen in summer, and some rather lost Narwhals and Belugas have been seen in winter. Other sites on the Diamond Circle include the likes of Goðafoss Waterfall, Æðafossar (“Eider Falls”), Hljóðaklettar (“Echo rocks” or “The Whispering Cliffs”) and Laugar swimming pool. Do note, however, that not all tour operators travel to each of these attractions. If you are looking to visit each location individually, with nothing missed, it is recommended to drive the sightseeing route yourself.